Before Starquest, Starpower, Starbound, Starsystems, Beyond the Stars, (did I miss any other "star" competitions? ), Dance Moms, SYTYCD, and all of that, Philadelphia had its own way of judging kids talent, and it was the Police Athletic League, or PAL, Competition. For decades, it functioned as a Philadelphia dance school version of March Madness, with kids from all over the city competing at their local recreation centers, the local winners battling it out at bigger regional events, and then, all of those winners fighting for the top prizes at the coveted finals. The local competitions included dance and music, and the finals only divided kids by age, thus pitting dancers, vocalists and musicians against each other. My pianist brother made it the finals in 1986, and he lost to a young singer, I believe. 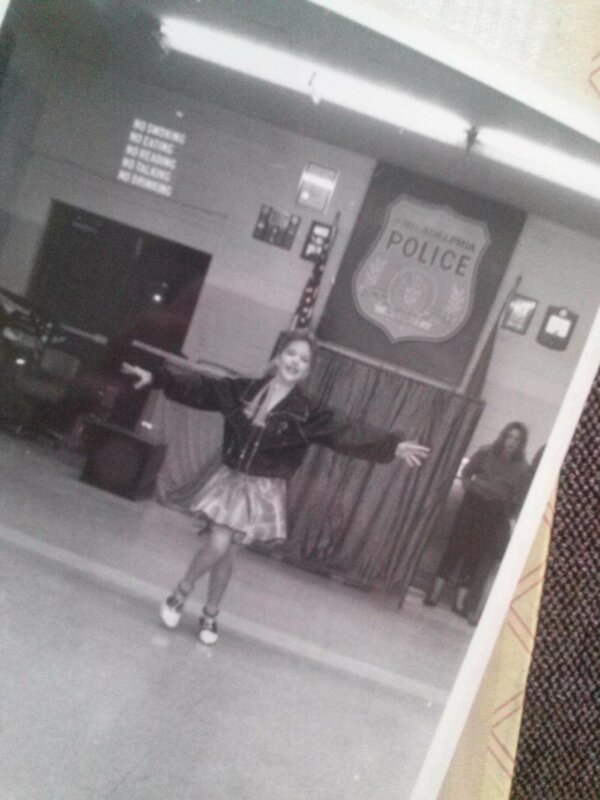 I didn't start competing with a small tap group until I was eight, so around 1988, I entered the fray. Remember, this was WAY before the age of social media, yet the turnout for the local rounds was enormous. I can distinctly recall standing in line for over two hours to perform in the 1992 "solo tap" category round at the Lawncrest Recreation Center. The line of competitors went around the entire gymnasium. And you didn't want to lose your place in line. Nobody would have come looking for you, when it was your turn, and good luck trying to cut back into the same spot. I laugh to myself when I hear parents or kids describing "tough" competitions in today's circuit. Young whippersnappers, we were competing for first, second and third place. The proverbial gloves were off, and the talent was fierce. The judges were even fiercer. In tap, your technique, timing, personality, and speed had to be professional-grade. Your nerves had to be made of steel. Getting to the finals was the ultimate goal. In the 1990 battle Royale, I made the finals in my ten-year-old tap solo category. None of this history is written down, so I can't check, but I believe that by the time I was standing in line at Lawncrest Rec, it was the last PAL competition of its kind, (although it lived on in other ways, which I will describe). Bigger events included Philadelphia outdoor festivals with massive performance stages, (see below), the Robin Hood Dell, the Adams Mark hotel, (now long gone), Phillies games, PAL Christmas events, and fancy banquets. More than competitions ever did, these experiences helped me grow and learn and also, see the city. It was just really, really cool. I have no other way of explaining it to people who weren't there, but as a 10-year-old aspiring dancer, there's not much that can compare to stepping out on a big stage in the middle of the Ben Franklin Parkway and doing a tap solo, while hundreds of people watched. But what I find most special about the traveling talent troupe is many of the people who danced with me then are still dancing now! Some of us own our own studios, and I see many of us teaching 7 days a week. Some of us are still performing and touring around the world. I believe that PAL inspired a generation of Philadelphia dancers to keep creating, performing and teaching. It certainly did for me. For the last twenty years, since I stopped dancing with PAL and went off to college, I have had this itch to create my own traveling youth dance group, and recreate the experiences that I had as a child. It wasn't until April of this year, when the studio expanded to 2511 West Girard, that I was finally able to realize that dream and start "The Philly Clicks." I have fulfilled so many dreams over the last several years, but living this one is the sweetest. Just a few months in, and these kids have done something that I had never been able to do at their age - perform at the Mann Music Center! I know these experiences will stick with them for many years, and even better, I get to re-live so many happy memories along the way. Keep up with The Philly Clicks this fall as we travel to all different corners of the city. By this time next year, I hope to realize another dream - making the ensemble 100% free for all participants. Thanks once more to our first corporate sponsor, MMPartners, for helping make dance accessible to as many kids as possible.